SAFETY, WE CAN’T STRESS IT ENOUGH! When it comes to firearms and safety, there’s no such thing as too much. Everything we do here at Royal Range is aimed at helping gun owners be safer and more responsible every time you carry or use your weapon. 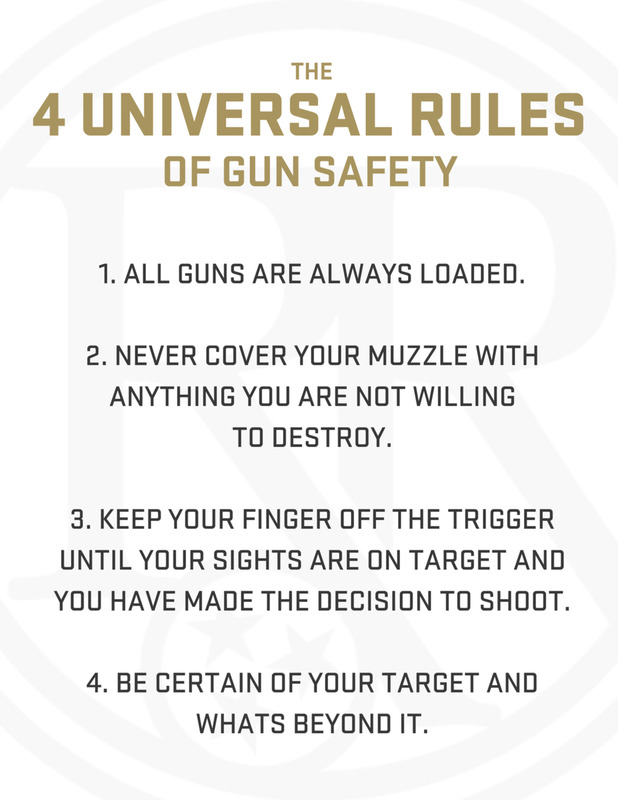 Toward that end, we value and adhere to the Four Universal Rules of Gun Safety. In addition to the four universal rules, Royal Range has its own safety guidelines designed to keep our guests, our staff, our facility and all the activities and training that take place here as safe and secure as possible. All firearms must be unloaded, in a closed container or holstered when entering or exiting the Range. No hand-loaded ammo is allowed in our facility. Shooting hand-loads will get you banned from our Range. Factory reloaded ammunition is approved. No inexperienced shooters are allowed in the Range without prior instruction and advance approval from the Range staff. Presentation from a holster is not allowed. The call of “Cease Fire” or the sound of a whistle means stop shooting immediately. If you need to leave the Range for any reason, unload your firearm at the shooting stall and case it. Eye and ear protection must be worn at all times while in the Range. Only authorized firearms and ammunition may be used. The Range Safety Officer has final approval on acceptable ammunition types. Non-commercial reloaded ammo is NOT allowed. Steel Core, Tracer and Incendiary rounds are strictly prohibited. Only CONTROLLED rapid fire is allowed. Only one person may shoot at a time, with a maximum of three people per shooting lane. No alcohol or drug consumption prior to or while shooting. If you experience a problem with your firearm, please leave the gun on the shooting lane shelf, step away from the booth and raise your hand for help from the Range Safety Officer. Load and handle firearms ONLY at the shooting stall. No loaded firearms are allowed behind the yellow or red line at back of booth. No food, drinks, gum chewing or tobacco products are allowed in the Range. Shooters may only shoot at a target in their assigned lane. No cross lane shooting. Please place all used targets in the trash containers provided.